It’s that time of year again. The holidays are upon us, and a regular army of Dickensian ghosts have begun to haunt the city–specifically, those of Christmases Past, Present and Future, found in a myriad of Christmas Carol adaptations across Toronto. When it comes to Charles Dickens’ classic ghost story and moral fable, Soulpepper‘s annual adaptation is a dependable tradition down in the Distillery District. And for good reason. By now, you probably know the story: a miserly, greedy old man named Ebenezer Scrooge (Joseph Ziegler) is visited by three ghosts (all played here by John Jarvis) on the night before Christmas, each of which show him ‘shadows’ that pertain to his past, present and future. Will Scrooge reform, and keep Christmas in his heart all year round? Or is he doomed to an afterlife of ghostly chains? Of course, we all know how it’s going to turn out. The devil, with this well-trod story, is really in the details: will Scrooge’s story of redemption ring true? Will the story feel classic and inspiring, or fall into the trap of saccharine sugar and eye-rolling pathos? And will another version of A Christmas Carol be worth the trek through the cold and the snow? Thankfully, Soulpepper’s adaptation is worth the snowstorm. It’s a rich production, though not overly ostentatious: most of the action takes place on a plain dark stage, with spare sets and props (save for one scene at a workplace dance). Extras bundled up in subdued Victorian garb get across the sense of a smoky, busy London, but when the stage gets sparse and bare and the lights go down to near-darkness, there’s a Gothic emptiness perfect for a spectral visit or two. Joseph Ziegler as Scrooge, reprising the role, is clearly at home with the character. He spits and huffs as the greedy old Scrooge of the play’s first few scenes, before transitioning believably into a more vulnerable, changed man. He plays Scrooge’s determination to do good after his trio of ghostly visits with a sense of mischief and giddiness that’s impossible not to like. John Jarvis plays endearingly off Ziegler’s Scrooge as the three ghosts, each with its own sense of distinct gravitas and joy (save, of course, for the final ghost). Rounding out these two main players is a strong cast. Particular kudos must be given to Jordan Pettle’s Bob Cratchett, who gives a generous performance as Scrooge’s impoverished clerk. His fears for his youngest son, the weak-hearted Tiny Tim, play across his face even as he strives to be cheerful. He portrays the character’s goodness with quiet nuance. Similarly, Kawa Ada is infinitely likeable as Scrooge’s nephew Fred and Young Ebenezer, in a double-casting that brings particular resonance to the reconciliation of the two men at the end of the play. His bright-eyed cheer and good humour are a joy at every turn. The nature of staging the show in the round, however, means that some details will inevitably be missed depending on where you’re sitting. In my seat in the third row, for example, it was difficult to see elements that were projected onto the stage floor. The show doesn’t suffer from it overmuch–we all know that the grave belongs to Scrooge even if we can’t read the letters–but moments where heads emerge from the stage floor can cause a bit of audience-shuffling for better sightlines. I also don’t know that the staging of Tiny Tim’s death was entirely necessary–the family interacting over the literal dead body of the child is the only moment where the show’s emotional resonance feels straining, as though they don’t trust that the Cratchett family’s grief and sorrow over the loss of their youngest child will be enough to carry the moment. I think the moment would be stronger if the loss was marked more by Tiny Tim’s literal absence from the stage–certainly, this cast can carry it off without the stark evidence of a dead child lying on a coffin. Despite these minor complaints, however, this is certainly A Christmas Carol worth braving the snow for. With rich costumes, resonant staging and powerful acting, this is a classic story told classically, making for a trim, well-executed night at the theatre. It’s easy to forget that the message of this Christmas story is far more transcendent than its tropes and trappings: the lesson that Scrooge learns is not simply that he ought to celebrate Christmas. Dickens’ lesson was that the spirits of charity, love and kindness to our fellow human beings–sensations felt so particularly around the holidays–are things we ought to extend to the world all year round. In these troubled times, that message of goodness and hope, and the ability of anyone to change for the better, resonates even more strongly. 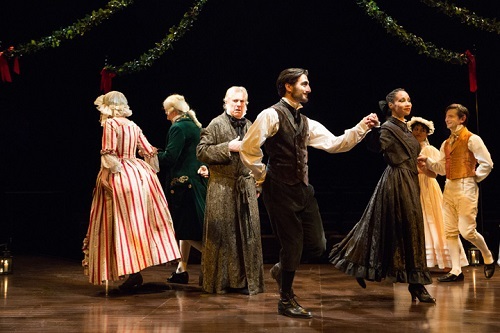 And with that, I make my own prediction: go see Soulpepper’s A Christmas Carol! You’ll enjoy it! A Christmas Carol plays until December 24th at the Young Centre for the Performing Arts (50 Tank House Lane). Tickets start at 35 dollars, and are available online, by phone (416-866-8666), or at the theatre box office. Note that the Distillery District’s Christmas Market is running throughout the show’s run. Parking will be busier than usual, so come early. Weekend tickets to A Christmas Carol include free entry to the market. Photo of ensemble cast by Cylla von Tiedemann. I saw the Soulpepper production a couple of years ago and loved it. It was the first time I had ever seen the humanity of Scrooge.